Pork floss goes by many names. In Chinese, it's rousong; in English, meat wool, meat floss, pork floss, or flossy pork—all of which refer to the meat's dry, wooly texture (the literal translation from Chinese is "meat fluff"). 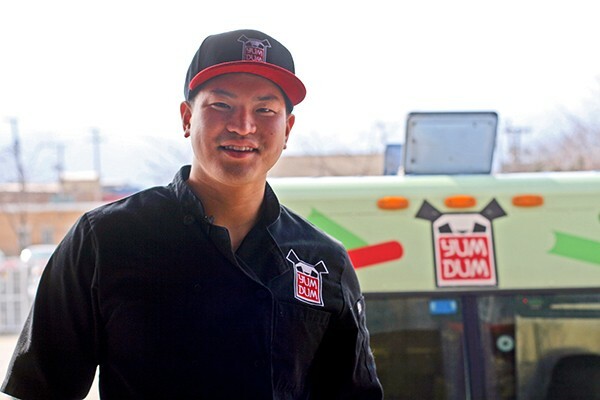 Jeff Wang of the Yum Dum food truck, who was challenged by Salsa Truck chef Dan Salls to create a dish with pork floss, says it was one of his favorite childhood snacks. "I was always the Chinese kid who'd take his pork floss sandwich to school," he says. 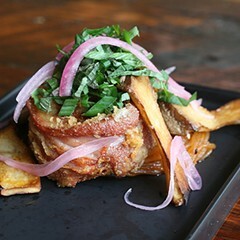 To make the floss, pork is stewed with soy sauce and aromatics, shredded, and then dry-fried until fluffy. It's traditionally used as a topping, particularly on congee. "You can put it on anything," Wang says. 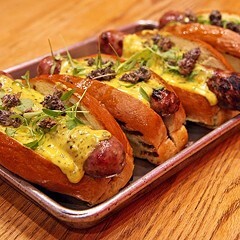 He also experimented with mixing pork floss into dishes rather than using it as a topping, which he doesn't recommend: "it gets saturated, soaks up all the oils and juices, and gets an unappetizing texture to it." For this challenge, Wang says, "I wanted to do something really cool and unique. But the more I tested it out and played with it, the more I went back to my roots." 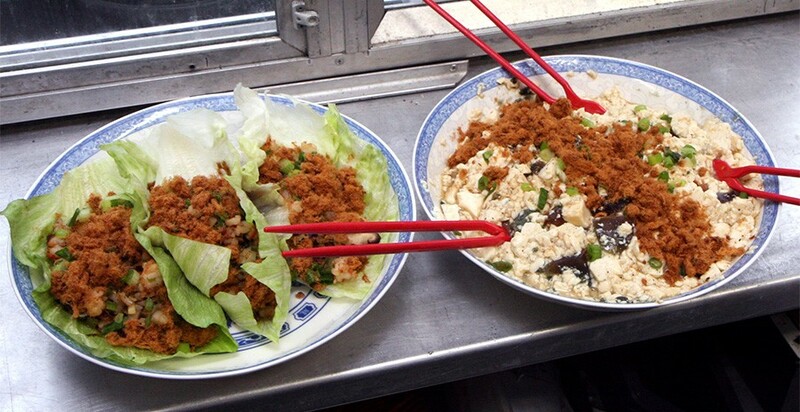 In the end, he faithfully reproduced two dishes his mom made often when he was growing up: a shrimp lettuce wrap and pidan doufo (tofu with century egg)—both generously topped with pork floss. There are two types of pork floss, Wang says: one is called pork fu, the other pork sung. "They taste exactly the same," he says. "I have yet to figure out what the difference is." (According to online sources, pork sung has a finer texture than pork fu, which is less shredded and more fibrous—but the two are otherwise virtually identical.) To be safe, he had a container of each type. For the shrimp wraps, Wang sauteed ginger, garlic, water chestnuts, and jalapeño before adding the chopped raw shrimp and some shiitake mushrooms and tossing the mixture with soy sauce and sesame oil. He smeared the lettuce leaves with hoisin sauce, filled them with the shrimp mixture, and topped the wraps with green onions and pork fu. Pidan doufo is even simpler to make: Wang cubed silken tofu, peeled and quartered a couple of century eggs, and mashed the two together with plenty of soy sauce. Again, green onions and pork floss (the pork sung this time) went on top. 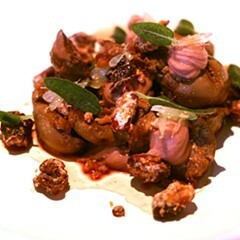 It's a dish that Wang says was always in the fridge when he was growing up. "You'd be surprised [at] the stuff I grew up eating," he says. Despite their dark green, gooey yolks and distinctive aroma, century eggs (which are preserved for several months before being eaten) didn't faze him. He can't say the same for his college friends, however. "My mom used to send me home with food all the time, because she's the best Asian mom," Wang says. "I'll never forget when my friends saw a box of century eggs in the cupboard and they thought that they were so rotten that they had turned black. I was like, 'No, they're supposed to be like that. They're delicious.'" Tasting the pidan doufo "really brings me back to childhood," Wang says. 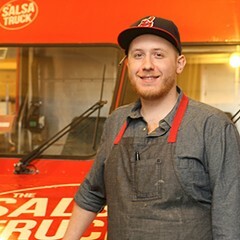 "The saltiness of the pork is just awesome with the tofu." The lettuce wraps also measured up to his memory of them. "Mom, I think you'd be proud," he said. 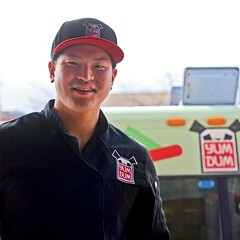 Wang has challenged Shawn Podgurski of the DonerMen food truck to create a dish with tofu. 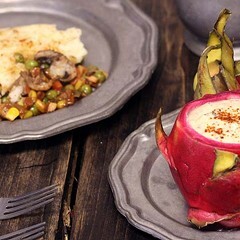 Can you stomach ponce, the sausage-stuffed pig stomach?